From 2014 to 2016, ESA’s Rosetta spacecraft studied Comet 67P/Churyumov-Gerasimenko and its surroundings from near and far. It flew directly through the ‘bow shock’ several times both before and after the comet reached its closest point to the Sun along its orbit, providing a unique opportunity to gather in situ measurements of this intriguing patch of space. As the supersonic solar wind flows past objects in its path, such as planets or smaller bodies, it first hits a boundary known as a bow shock. As the name suggests, this phenomenon is somewhat like the wave that forms around the bow of a ship as it cuts through choppy water. Bow shocks have been found around comets, too – Halley’s comet being a good example. Plasma phenomena vary as the medium interacts with the surrounding environment, changing the size, shape, and nature of structures such as bow shocks over time. Rosetta looked for signs of such a feature over its two-year mission, and ventured over 1500 km awayfrom 67P’s centre on the hunt for large-scale boundaries around the comet – but apparently found nothing. “We looked for a classical bow shock in the kind of area we’d expect to find one, far away from the comet’s nucleus, but didn’t find any, so we originally reached the conclusion that Rosetta had failed to spot any kind of shock,” says Herbert Gunell of the Royal Belgian Institute for Space Aeronomy, Belgium, and Umeå University, Sweden, one of the two scientists who led the study. On 7 March 2015, when the comet was over twice as far from the Sun as the Earth and heading inwards towards our star, Rosetta data showed signs of a bow shock beginning to form. The same indicators were present on its way back out from the Sun, on 24 February 2016. This boundary was observed to be asymmetric, and wider than the fully developed bow shocks observed at other comets. “Such an early phase of the development of a bow shock around a comet had never been captured before Rosetta,” says co-lead Charlotte Goetz of the Institute for Geophysics and Extraterrestrial Physics in Braunschweig, Germany. Herbert, Charlotte, and colleagues explored data from the Rosetta Plasma Consortium, a suite of instruments comprising five different sensors to study the plasma surrounding Comet 67P. They combined the data with a plasma model to simulate the comet’s interactions with the solar wind and determine the properties of the bow shock. The scientists found that, when the forming bow shock washed over Rosetta, the comet’s magnetic field became stronger and more turbulent, with bursts of highly energetic charged particles being produced and heated in the region of the shock itself. 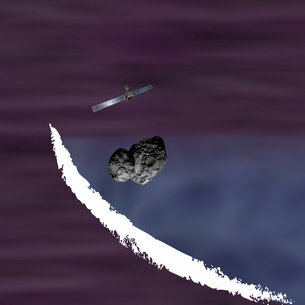 Beforehand, particles had been slower-moving, and the solar wind had been generally weaker – indicating that Rosetta had been ‘upstream’ of a bow shock. “These observations are the first of a bow shock before it fully forms, and are unique in being gathered on-location at the comet and shock itself,” says Matt Taylor, ESA Rosetta Project Scientist.